Lucas+Western Architects carried out a detailed feasibility study for the conversion of this Grade 1 Listed mediaeval chantry and guild-chapel into an arts centre. The building was left vacant in 2008 when its former occupier, the town library, moved to new premises. Since then it has been operated as a highly successful art-space by Wymondham Arts Forum, for the staging of art exhibitions, recitals and private functions. The brief was to accommodate up-to-date visitor facilities, meeting space and storage with as little impact on the historic fabric as possible. 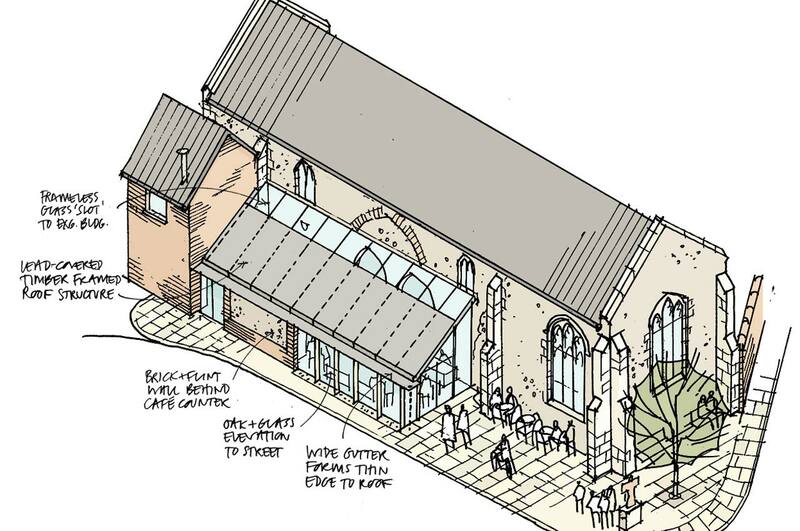 A new fully glazed ‘lean-to’ extension was proposed, occupying a space in front of the chapel where a side-aisle or transept is believed once to have stood. The lead-roofed, oak-framed extension would house a new reception area and server, connected to the main chapel building through an original double-arched opening which was blocked up when the original side-aisle was demolished. Inside a contemporary oak and glass ‘rood-screen’ would separate storage-space in the base of the former bell tower from the main exhibition area, with an open ‘minstrels’ gallery’ above to be used for meetings. The proposals were well received by the client, English Heritage and the local planning authority, and discussions are now taking place on Wymondham Arts Forum’s permanent tenure of the building before the project can be developed further.